It's always a humbling experience critiquing other people's artistic efforts and attempting to put your own out there. I spent Saturday morning in the company of some talented San Francisco Conservatory students, graduates and pro musicians auditioning for a spot as an oboist in the eclectic Magik*Magik Orchestra. I've been wanting to join this group for a while because the orchestra, which is based in San Francisco, isn't like other orchestras around here. Instead of scraping away at Mozart and Beethoven like every other ensemble on earth, they play scores for video games, accompany famous pop musicians and perform at non-classical events like The Hardly Strictly Bluegrass Festival. I had a blast at the audition, though I was well out of my league both in terms of the quality of the other instrumentalists and the repertoire we played. We wore headphones and played along with pre-recorded tracks for video game music. We improvised. At one point, we put down out instruments and sang. I've never experienced an audition quite like it and I wish more could be this way. I don't think the repertoire I auditioned with is the most satisfying music to play as an oboist. Very few if any excerpts were actually written for oboe. The bassoonist sitting next to me and I (we were the sole wind players in a group consisting of three violins, a viola and a double bass) had to hack our way through string parts verty frequently. Some of the music was fairly monotonous, consisting of endlessly repeated notes and three or four-note ostinati. But it was still fun to attempt this kind of repertoire. I may not make the cut, but it was exciting to get an insider glimpse of how the Magik*Magik orchestra makes music. Meanwhile, here on campus at Stanford, I had a very different kind of audition for the university "Early Music Singers" ensemble. The group, which has been going since 1972 (back when Stanford had a dedicated early music program), specializes in Renaissance repertoire. The upcoming concert series is a program of nothing but William Byrd. Bill Mahrt, who runs the chorus, says this is risky. I can't quite see why. In any case, Prof Mahrt and I had a chat, and then I sang him a few scales. Finally he had me sightread through a bit of an English madrigal which I essayed passably well. Or at least, well enough for him to admit me to the ensemble. It was the first time that I've ever tried out for a group in a space with no piano. And it was the first time that I've ever heard a conductor talk about what it's like to go from leading a group comprising of early music specialists (which was the case when it attracted members from Stanford's now-defunct early music program) to dealing with singers who aren't necessarily specialists in this kind of music. The main change seems to be linguistic, according to the professor. Back in the day, singers used to worry about things like rhyming the word "die" with "sympathy." These days, the chorus members mostly just want to get on with singing the notes. P.S. I went to what I thought would be a lecture series on "American Social Dance" earlier today. It turned out to be an actual dance class. Richard Powers is an amazing teacher. If I can put up with jiving, lindy hopping and swinging with a bunch of awkward undergraduates (who make up 99% of the class) then I think I will learn a lot. 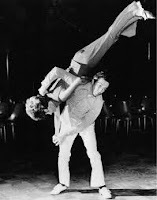 Prof Powers' most gratifying tip for swing dance beginners: There's no such thing as a mistake; stand on someone's toe or elbow them in the ribs and it's really just creative improvisation.